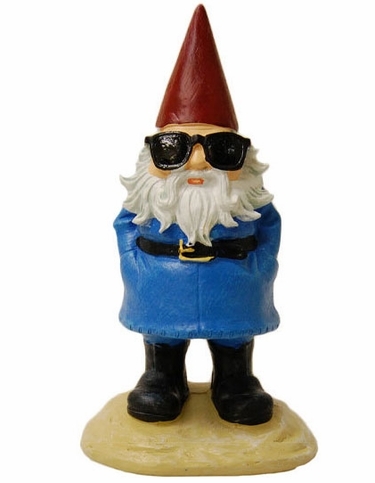 GardenFun is excited to welcome a spiffy new addition to our family � the Travelocity garden gnome with Sunglasses! This small Travelocity roaming gnome measures 7.5� high and will make your lawn and garden a fun, snazzy place to hang. When this gnome is not traveling, he wants to be in your garden charming the ladies and keeping your plants in check. He wants to become a part of your own incredible adventure. Give him as a gift to friends, family or coworkers. They (and you) have seen him on all of those crazy travel commercials, the Amazing Race and more. This 7.5� Travelocity garden gnome with sunglasses is hand painted and made from durable all weather cast resin. The lenses have a glossy finish making them reflect the light! And he�s officially licensed so don�t worry about him being an impostor! About me: I may be small but I�m feisty. I�ll keep all of those pesky squirrels, rodents and other riff raff out of your garden�or at least I�ll try to. I mean, I�m only 7.5� after all! Choose me and I�ll be the best roaming garden gnome you've ever laid eyes on.